Pass a lane on the left opposite the war memorial and continue uphill. Follow the lane as it bears left at the next junction, soon keeping ahead at a five-way junction by a cross, signed to Buckfastleigh. Follow the road for about 1.6km/1mile to reach the junction at Hockmoor Head, and turn left on the unsigned road. Descend to a crossroads at Fritz`s Grave and bear left for Buckfast on Grange Road. At the next sharp right hand bend continue along Higher Mill Road to the junction. Turn left, signed to the Abbey, and drop down towards the mill buildings of Buckfast Abbey. 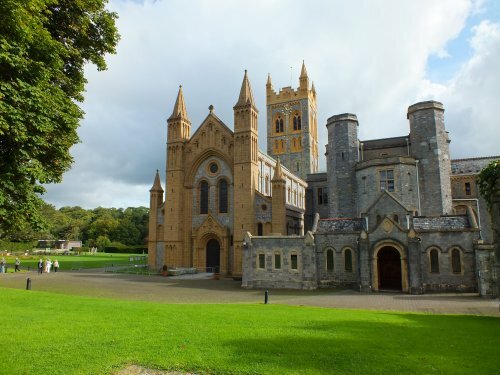 Buckfast Abbey is an astonishing structure, with an even more astonishing history. The original wooden abbey was founded in 1018, and rebuilt in stone by the Cistercians from 1147; it was dissolved in 1539 under Henry VIII. Local mill owner William Berry built a four-turreted mansion in the ruins (still in existence today) and in 1882 a group of six Benedictine monks from France set about rebuilding the abbey themselves, which took the next 30 years. Today fragments of medieval architecture sit comfortably alongside more modern construction. The welcoming Grange restaurant and tearoom is open to passing visitors. Turn right at the mini-roundabout and follow the road past The Abbey Inn (on the River Dart) to meet the mini-roundabout just before Dart Bridge (the circular Dartmoor Way joins from the right).